A few Blogs ago, I wrote about the "Constantinople Group" and included Souren Serebrakian (1900 - 1990). Though born in Tiflis, Souren Serebrakian found himself in Yerevan in 1920 where he put together a stock of Dashnak Armenian overprints which lasted him a lifetime. His philatelic activity began in February or March and came to an end in August or September, when he made his way out of the Caucasus. I started collecting and dealing in Armenia just after his death and acquired a lot of material from Serebrakian's widow in New York who continued trading until her own death (in 1997). I remember her as a lively and interesting person. Eventually, all the remaining Armenia stock was auctioned at Cherrystone. I always kept the photocopies of stocksheets which Mrs Serebrakian used to send me - now I have passed them to Stefan Berger to assist his work as an Expertiser for classic Armenian stamps. I was once told (I think by Dr Ceresa) that Souren Serebrakian was the nephew of a post office official in Yerevan. 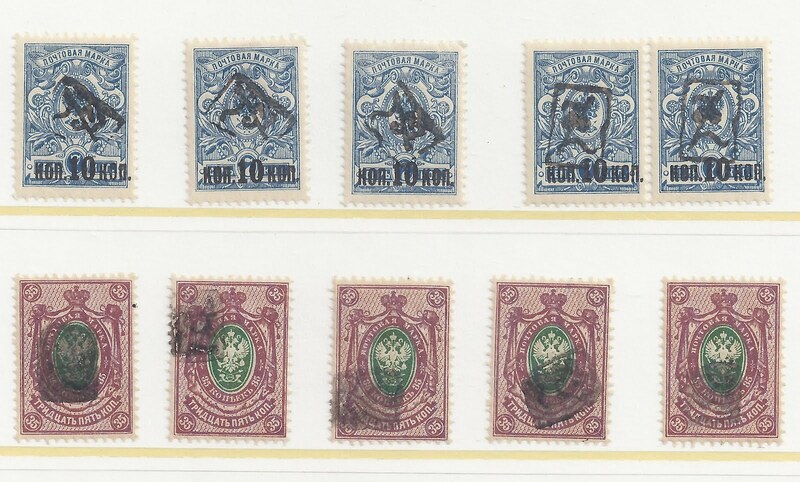 This may explain why he was able to obtain all kinds of "counter surcharges" to enhance his stock, notably overprints on Imperial stamps which were not being officially overprinted. Some of these stamps he put on postcards which he sent to his brother in Tiflis (they arrived). Maybe he was also allowed behind the counter to use the handstamps himself and to fool around making small varieties. 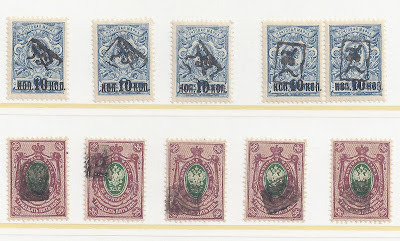 The illustration above shows two "Serebrakian Specials", created on stamps which were being officially and regularly overprinted in large quantities. (In the catalogue, they are Michel 8 and 12, with modest valuations). In the first case, he has angled the large framed Z handstamp, pressing down on the right hand frame. The handstamp has also been inverted. I show a pair of normal overprints, with the framed Z the right way up, for comparison. In both cases, it is only when you have a few copies of the Specials that you can really see that you are dealing with a deliberately created small variety. Probably each Special was created in small quantities: you did one sheet using one trick, then the next sheet using another trick. Occasionally, Serebrakian signed these varieties. In later life he used a small boxed SER - and as far as I can tell, he usually reserved this for stamps which he knew to be scarce (like framed Z on 1 kop perforated or 7 kop perforated). None of the stamps shown above have this boxed signature. Postscript 8 May: In his Comment (see below) Vasilis asks the interesting question, How do I know the overprints on 35 kopeck are original, from genuine handstamps. (2) there is a family of these smudged / unclear overprints with some of them showing more clearly the outlines of the handstamp used. I have picked some from my stockbook and show them below - not all of these are from the same handstamp (some are medium and some are Large). back in the 1990's I had also purchased material from Serebrakian's stock. Among many others there was a smudged A4-type black overprint on 35k (very similar to your overprints), placed at lower left below the arms oval. I have placed the particular stamp in the unidentified / forgery section of my Armenia collection, because I could not make out any details of the overprint to categorize it as genuine. Is there something specific that makes you consider it as genuine, other than its provenance from Serebrakian's stock? Good question. I have added a Postscript into the original Blog.